People who visit Myrtie Mae's Homestyle Dining for the first time invariably ask about the lady whose name graces our restaurant. Yes, there really was a Myrtie Mae! 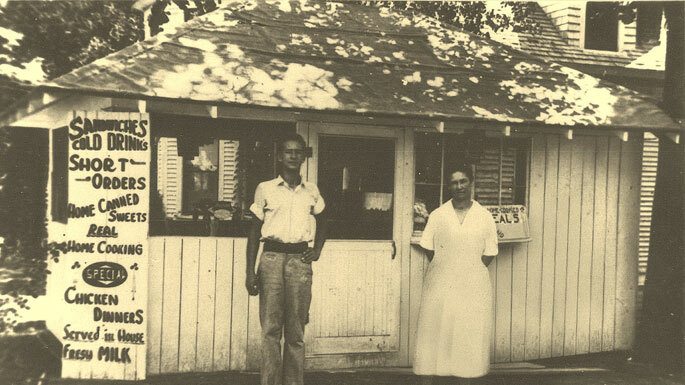 Myrtie's history begins in the 1920's when she began her restaurant on the very site where the Best Western Inn of the Ozarks now stands. She was famous for fried chicken. The Inn is still famous for the best Ozarks Fried Chicken. Myrtie Mae's provides a family-style atmosphere and has a grand view of the beautiful Ozark Valley below. We have lunch and dinner specials daily with all you can eat buffets at lunch on Tuesdays and Thursdays. Each meal comes with our bountiful salad bar, including homemade soups, specialty food items and our homemade muffins. Homemade desserts are a perfect end to a delicious dinner. Myrtie likes to bake, so the choices may change during the day. The fruit pies may be oven hot or just warm, but are never refrigerated or served the next day. Please ask your server for the freshest selection. Myrtie will be expecting you, traveler! Myrtie Mae's restaurant is located in the Inn of the Ozarks at the intersection of Hwy. 62 and the Historic Loop. Subscribe to Myrtie Mae's e-mail newsletter and stay up to date on all of Myrtie's deals, specials and news.